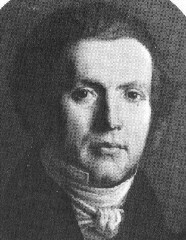 Born: 1787, Wittingen, Hanover, Germany. Died: 11 October 1846, Graaff-Reinet, South Africa. Georg Heinrich Krebs (or Johan(n) Georg Heinrich Krebs), elder brother of G. Ludwig Krebs*, completed an apprenticeship as an apothecary in Stuttgart. He served in the Prussian army and later settled as a pharmacist at Luckow. In 1820, then already 33 years old, he entered Berlin Medical School. His studies were paid for by his brother. After qualifying he remained in Berlin to act as his brother's agent in selling the natural history specimens Ludwig was sending from South Africa. About 1831 Georg received the complete body of a bushman from Ludwig, with a number of poisoned arrows. The skeleton was preserved in the Anatomical Museum in Berlin (which was destroyed during World War II). Georg recovered the poison from the arrows and described it in a pamphlet, De Afrorum veneno sagittario. Disquisitio medico-chemica auctore G. Krebs, Med. Dr., published in 1832. At the invitation of his brother, Georg Krebs arrived at the Cape of Good Hope in May 1834. That same month he was licensed to practice in the Cape Colony as physician, surgeon and accoucheur. In July that year he travelled by ship to Port Elizabeth and went to live with Ludwig on the latter's farm along the Baviaans River, near the future Bedford. During the Sixth Frontier War (December 1834 - September 1835) he collected two native skulls and preserved in alcohol a bushman foetus naturally aborted at five months. These specimens were sent with one of Ludwig's collections to Dr M.H.K. Lichtenstein* in Berlin. In April 1835 Georg left the farm to settle in Graaff-Reinet. He dispensed medicine and maintained a small private practice, both in competition with (among others) an English chemist, C.H. Grisbrook*, who also practised medicine. In 1837, after the death of district surgeon Dr Thomas Perry*, Georg was appointed to fill the vacancy. On 24 April that year he married Jacomina Jacoba Jansen van Rensburg. She died in 1840, but they had one daughter. Georg was an unreliable character. He lied about his age both when entering medical school in Germany and when applying for permission to practice at the Cape. Furthermore, while still in Germany he misappropriated a substantial portion of the money entrusted to him from the sale of Ludwig's specimens. Ffolliott, P. & Liversidge, R. Ludwig Krebs, Cape naturalist to the King of Prussia. Cape Town: Balkema, 1971. National Automated Archival Information Retrieval System (NAAIRS). http://www.national.archives.gov.za/naairs.htm Documents relating to George Krebs.